In this article, we will understand products that help manage an organization’s infrastructure from inception to retiring the physical/virtual machines. There are various products that handle individual functionalities and all of these are handled from one suite for intercommunication amongst them. Following are the topics that we are going to cover in this article in detail. Microsoft System Center Configuration Manager (SCCM) is a Windows product which enables administrators to manage security and deployment of applications, devices that are part of an Enterprise. System Center is the family or suite of management tools from Microsoft. Organizations would rather purchase System Center Configuration Manager than purchasing a component in the System Center for updating or patching their systems. Earlier to the advent of any Systems Management tools, IT departments struggled a lot with the server and client system management. With the tools like Microsoft System Center, patching a computer, imaging workstations, rolling out software, monitoring servers, network devices and backups were all done in a tedious manner. As tools evolved around the systems management, there used to be dedicated servers for these requirements and this had to repeat for another set of requirements. This was all a clumsy process as there was no communication between these separate servers. Get ahead in your career by learning SCCM through Mindmajix SCCM Training. To understand this, consider an example where an organization keeps track of assets through one product and have a separate one to put images onto these systems. It has a product to update or patch the systems when required and another one to monitor the system and alert the administrators in any unforeseen situations. Finally, a different product to backup data and a different product to provide security management of the system also exist. Having said this, Microsoft was in a situation like this for about 5 to 8 years when all of these were handled via different products. After many years, Microsoft had put all of these products into a single suite of products called the System Center and spent enough time to get all of these products to work together. Now, an organization which wants to buy a new license can actually buy a suite license to work with all these products under a single umbrella and leverage benefits out of these products for their own enterprises. The section focuses on bringing in a product as like System Center which can handle all the activities of a system from imaging, deployment, patching, updating, maintenance, support, and retire under a single life-cycle management tool. System Center Configuration Manager (SCCM) comes with the ability of imaging and installing the base operating system on a system based on the configuration provided. Once an operating system in installed, SCCM kicks in to update or patch the system. It keeps track of the system inventory and remote control capabilities. It enables IT administrators to keep up with the system configuration of all the machines based on a single and common organizational configuration. SCCM is the product that lays down the base configuration of a system and keeps it updated and patched. System Center Operations Manager then takes over the responsibility of monitoring the health of the system along with all other applications installed on that specific system. There are specific set of rules that track down the normal functioning of the system, and if there are any deviations, the necessary personnel is notified of the changes. Data Protection Manager (DPM) comes in handy when SCOM reports any faults on a physical machine. DPM helps in recovery from the backups that it holds. DPM takes backups of server file system, sharepoint data, exchange databases, SQL databases on a standard schedule. This helps in recovering a system by full data recovery which is either corrupted or damaged. There is a shift of organization’s physical systems to virtual systems for development, maintenance, and production, and hence comes a tool that handles all the life cycle related activities for the virtual machines - System Center Virtual Machine Manager (VMM). If there is an instance where a physical or a virtual system is about to fail, SCOM can trigger an automatic creation of new session using SCCM and Hyper-V to build a new virtual system. VMM also helps in transferring the operating system, application, and data to a virtual machine in an automated Physical To Virtual (P2V) process. Most of the tools from the System Center suite of products revolve around the IT related tasks such as patching, imaging, monitoring, backups - there are other organizational needs such as managing processes and change control. System Center Service Manager (SCSM) is an incident management and change control system which integrates with SCCM and the like seamlessly. It helps in logging all the issues identified with these tools and gathers all the details around the issue for a one-point reference to the Desk personnel or the Support personnel. With the growing needs of an organization, there is always a need to upgrade the infrastructure for an organization. System Center Capacity Planner helps in identifying and testing performance demands from the current setup and plan for the future requirements aptly. Based on the current requirement, it helps in identifying the relative requirements on the hardware to meet the performance demands for your organization. Organizations run on Servers and Clients for their related operations, but with the advent of smartphones with an equal computing power, mobile devices also have joined the bandwagon for operations carried out in organizations. System Center Mobile Device Manager (MDM) joins hands with System Center Configuration Manager (SCCM) to handle all the life cycle stages from inception to completion for all mobile devices and in simple words, MDM is to mobile devices what SCCM is for servers. Provisioning, monitoring, updating, securing, wiping the devices are all the activities that can be done with MDM. Not every organization might have a dedicated IT wing to handle all the system, server related stuff (organizations with less than 500 users or 50 servers). Microsoft provides System Center Essentials which enables management functions related to tracking inventory, patching and updating these systems, monitoring, deploying newer software. All of these can be done from just this single tool, helping them to scale on their system administration capabilities. 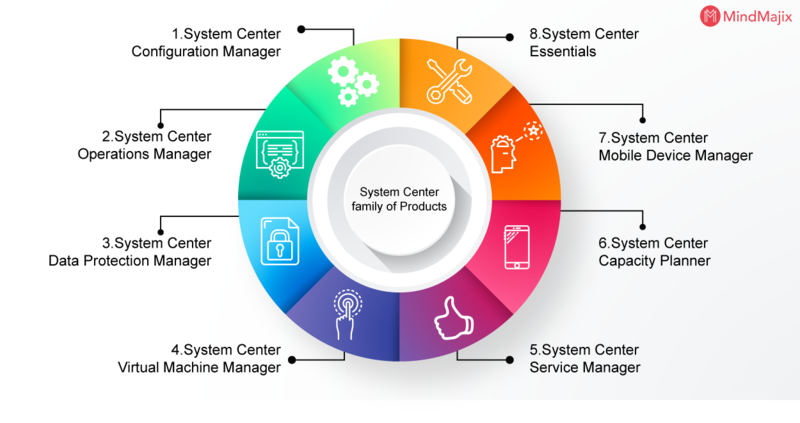 In this section, let us try and understand the major features that are provided by System Center Configuration Manager (SCCM). Installation of the core Operating System is the very first step that needs to be done to initiate the life-cycle for a server altogether. SCCM provides all the tools an organization require for Operating system deployment - either via the imaged installation or as a scripted method of installation. When the installation of Operating system is completed successfully, SCCM initiates patching and updating these systems. Most of the organizations rely on the free service (Windows Server Update Services) to patch and update the systems but SCCM leverages everything that WSUS provides and over that, provides the IT administrators an active patching and updating in addition to WSUS. The active update system enforces updates, forces systems to be patched or updated and later rebooted following the IT guidelines published by organizations. Once a system has been created with the Operating system that is required, and later updated, patched, such systems need to be kept in track of further timely updates or patches. SCCM includes the tools that are required to keep track of the hardware, software assets of the system that it is managing altogether. If a user or a system encounters an issue which might require further assistance of an IT administrator, there is a provision to take remote access of the system to analyze the problem. SCCM has a remote control process that allows an IT administrator or a support engineer to access the system remotely. Installing the core operating system on a physical/virtual machine is one part and the other part is the additional softwares that are required on a system. SCCM provides a tool that allows to install a simple plugin or a complex suite of applications with unique application configuration. This is one of a kind functionality that makes it more suitable for organizations where certain IT guidelines can be implemented without halting anything. This is the other feature that follows the IT guidelines outlaid by an organization where the standard configuration of a system cannot be altered. This ensures that the system has the same software setup, updates, drivers and configuration settings across all the systems. Desired Configuration Management (DCM) tool within SCCM ensures the stringent audit constraints are met and compliance is maintained. This is a significant component on the SCCM tool which enables devices like remote systems or mobile devices be accessed remotely without specifically bringing them into the VPN network for any maintenance requirements. This can now happen via an Internet Client and a PKI (Public Key Infrastructure) certificate installed on the system. With these prerequisites, SCCM will be able to connect to that device anywhere in the world automatically to inventory, patch, update, monitor the system. SCCM provides an out of the box integration with a report generation tool that generates reports based on the requirements outlaid by the IT administrators. These reports may vary based on the requirement like report of systems that have missed the patches or updates, report of standard configuration, inventory reports, etc. System Center Configuration Manager (SCCM) helps an organization maintain consistency in the system configuration and management across all the systems. Rather than having to build a workstation or a server manually and individually, SCCM makes use of the templates to build these systems pretty quick. IT personnel can create these templates based on the guidelines outlaid and also to meet the requirements of the organization. In the case of template-based installation, organizations can very well depend on the consistency in the build configuration for all the hardware systems throughout the enterprise. SCCM in conjunction with other components ensures achieving different functionalities. One of the best examples of such a component is System Center Operations Manager (SCOM). System Center Operations Manager (SCOM) along with System Center Configuration Manager (SCCM) helps an organization stay ahead and proactive to identify issues, faults on time and helps take necessary actions to minimize the downtime on any issues. These tools also help recover systems that have failed for various other reasons with the help of a tool called Data Protection Manager (DPM). It also enables monitoring of the normal operations of the available set of servers, workstations, and applications. There are policies that are established to update systems of a specific functional role be updated or patched at the same time. This is a feature that is provided by one of the SCCM components called the Desired Configuration Management (DCM). It ensures specific updates are pushed to systems that meet a functional role. This further helps in ensuring all the audit requirements, and also in maintaining compliance at an organization level. This helps in answering all the questions related to audits and compliance requirements with just reports and nothing at all. IT consumerization is the fact of day and resistance against this will not allow an organization to scale further. With more and more devices being available in the market, there is always an expectation to support all of these. As SCCM has always been about systems management, considering the changing landscape, user has been given all the attention that it requires. This allows them to gain more control over the software that is installed. An example of this is the definition of user's working hours and based on these timings, the upgrades and patches are applied on the system. There can be more one device tagged to a single user, meaning that there can be more than one primary user for every device that is being worked upon. These relationships are handled using the User Device Affinity (UDA). 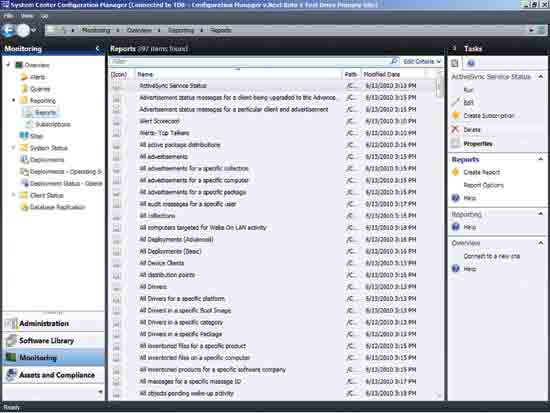 Users can manage their own systems using a new interface called the Software Center. This is more like a shopping cart approach where users search and find what they want to request for installations. Based on the applications, few might be installed right away and few others that require administrative approvals. Based on the recent trends amongst the products in the industry (in general), there is a growing adoption towards role-based security. This has now been introduced in SCCM 2012 and is controlled by Role-Based Access Control (RBAC) hiding the elements that the user doesn’t have access to. The tasks are grouped into security roles administratively. There are few roles provided with the tool and, in addition to that, business-specific roles and scopes will be added later. 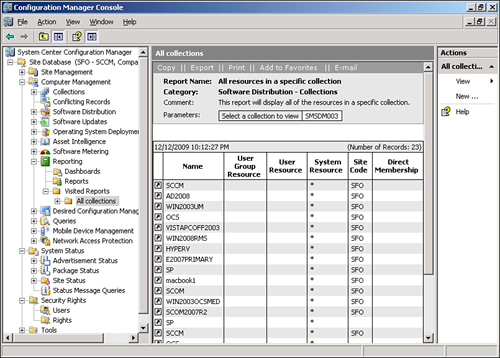 System Center Mobile Device Manager (MDM) 2008 wasn’t exactly a success but its functionality was rebuilt into SCCM 2012. Support for iPhone, Android, and Windows phones was covered through the Exchange Active-Sync connector. In this article, we have tried to understand the business problem that Software Center Configuration Manager (SCCM) tries to resolve. We have understood the systems management in an enterprise and how SCCM resolves this problem with the features that it provides. 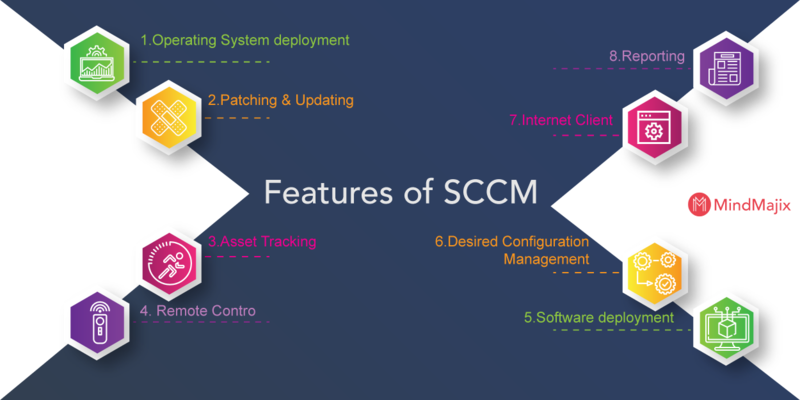 We have then discussed the System Center suite of products and its features, along with it, we have also taken a closer look at the major features provided by SCCM. We have also seen the business use cases where SCCM finds its usage. We have also discussed the new features that are provided in the latest releases of SCCM. Hope you have found all the details that you were looking for, in this article. Explore SCCM Sample Resumes! Download & Edit, Get Noticed by Top Employers! Download Now!